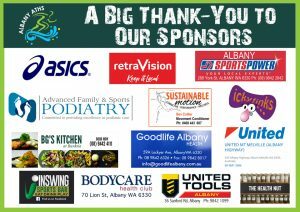 The Asics Elleker Half Marathon and Retravision 10 km Road Race is an annual event, presented by the Albany Athletics Club Inc. This event attracted a recoded number of participants of over 260 entries in 2018. Participants travelled from as far away as Perth, Bunbury, Busselton, Esperance and even the USA to take part. The event is conducted in and around the small township of Elleker, situated 16 km west of Albany, (400km south of Perth). The course is a pleasant, relatively flat route around Grassmere Lake, travelling through picturesque karri forests and farmland. The mild weather at the time of the event (Sunday of the June long weekend) makes for perfect distance running conditions. We now have 5 event options to choose from: Half Marathon, 10km Run, 10km Walk, Schools Kids Team of 4 (Culumative Time) and 2km Kids Dash. And this year we have slightly altered the course to an improved and safer course. You no longer run down Hassell St, instead we have a some laps around Elleker Oval and a short distance down Mutton Bird Rd (Half Marathon only). ALSO……This year all events will be timed with “Chip Timing” by the Fantastic Idle Timing.